India Ramey is unafraid. Putting herself on the line is a matter of course, which her new record, Snake Handler, confirms as it delves into a hard-earned literature often reserved for characters in Southern fiction. She writes what she knows. Ramey, originally from Rome, Ga., by way of Birmingham, Ala., earned her law degree at the University of Alabama, against all odds really, due to financial hardships and a past she couldn’t shake. Her mother was the victim of violent domestic abuse. In a powerful bit of irony, Ramey earned scholarship money by competing in Miss Alabama pageants. The competition gave her a platform and she spoke out against domestic violence, a subject that struck close to home. “All through college, I did domestic violence advocacy counseling,” she says. “My first job out of college was as a prosecutor for the Montgomery County [Alabama] DA’s office. I ran a special prosecution unit for violence against women for the county. “My mother was a battered woman,” she continues. “It was so personal to me. I would be in a perpetrator’s face all day, you know, trying to get him to show me who he was. And sometimes you lose, and I had to walk out that same door. I would take different routes home every day because you don’t know if they’re going to get after you. You’re the one that stands between him and his victim. Ramey brings her passion for survival, and a certain defiance to bear, with her music. The self-released Snake Handler is her third record, following Junkyard Angel (2010) and Blood Crescent Moon (2013), and represents a shouting into the storm of blood and family. She is coming into her own as a powerful artist and lyricist, and coming to terms with herself. With new songs like the loping title track, and “Devil’s Blood,” Ramey is exploring and exorcising. She walks an edgy line between hard country and rock & roll, with a vocal presence that is out front and undeniable. Her voice wears a raucous country mantle, and she knows how to get real. “I can’t write anything that I don’t feel passionate about,” she says. “That’s why a lot of my songs are really dark and angry. I’ve been there, and that’s why the Southern Gothic label has been hung on me — dark and all that. 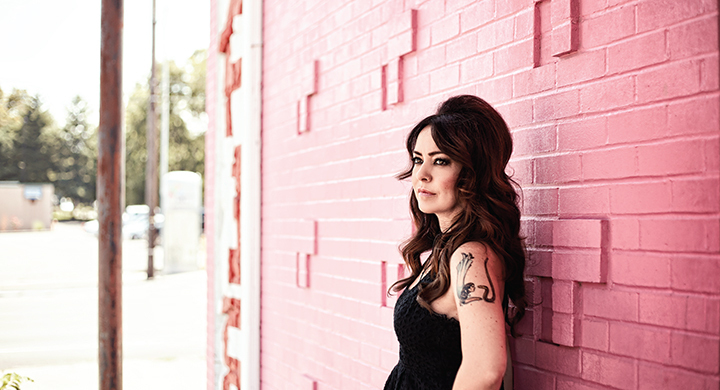 Ramey has taken the road less traveled to find herself, her musical career, and to find a home in Nashville, forging a straight-up expression with maturity and courage. Her father is deceased, and she has certainly faced down her demons on that front. Her mother escaped the violence and remarried when Ramey was still young, giving her a sense of stability — but the lingering resentment and anger were always there.